Dr Mohammad Javed Ali is a globally known name in the field of Dacryology, the science that deals with the tear ducts and tears drainage. He heads the Govindram Seksaria Institute of Dacryology at the renowned L.V.Prasad Eye Institute in India. 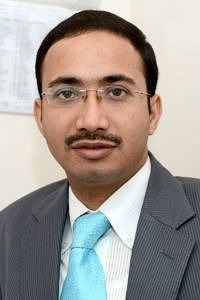 Dr Ali is well trained in Ophthalmic plastic surgery and Rhinology, a much desirable combination for a Dacryologist. He is a prolific researcher with more than 200 papers to his credit and not surprising that he sits on the editorial board of five major journals. As Ophthalmology clinician, he is among the rare recipients of the “Experienced Alexander Von Humboldt Research Fellowship”. He would stay at FAU for 4 months each year starting in 2017. We caught up with him for a brief chat and here are the excerpts from the meeting! What initially sparked your interest in this field of research? Let me first thank you for inviting me for this interview. From very early on in my career, I fell in love with the tear ducts and had a lateral thinking in dealing with the lacrimal challenges. I also realized early that there were not many who practice lacrimal disorders with a focus and attention it deserves. For practicing impactful medicine, research is as crucial as the clinical work. The answer to this is straight! Two factors influenced my choice of FAU. First being Friedrich Paulsen, whom I consider as the best living anatomist on Earth today and secondly, the stunning research facilities for cellular anatomy and pathology. It is quite visible in the fundamental research in Dacryology! If you compare your home university to FAU: what are the most evident differences? I think every place has its merits and demerits. I would rather focus on the strengths we share since this would help me maintain the momentum for the continuity of my research at both the places. We are currently working on unravelling the multifactorial etiopathogenesis of lacrimal drainage obstructions. Since gender predilection of these obstructions is established, an extensive work on the hormonal profiling of tear ducts has begun! I think it is too early to comment upon, but I promise to keep you updated if you would like me to! I am strong believer of translational medicine that impacts communities and societies at large. Tear drainage obstructions are quite common in populations and I am hopeful, the day we get to know why these happen, solutions will start flowing in, which would impact a large section of humanity. The first time I landed here in 2014 was on a Sunday. I had no clue that everything, literally everything shuts down on a Sunday! Had it not been for Friedrich Paulsen, I would have remained hungry. I think my most memorable moments have been the kindness and generosity of Friedrich Paulsen. He does not carry the baggage of being the Vice-President of the University or the Director of the Anatomy Institute. Friedrich has done what a family does, right from giving me bicycle lessons on the road to talking to my landlord when my TV does not work! What more can someone desire in a Mentor? Obviously, the Anatomy Institute! Other than that, I love the botanical gardens and the inspiring Siemens Museum. Thank you for the interview, Dr. Ali. Thank you very much for having me here!